A small fern plant which sprouts a shoot at the tip of the plant, referred to as a "frond" or a "crosier," that is harvested to be served as a vegetable. Known as the Fiddlehead Fern, this plant is similar to other ferns that sprout from spring to early summer in moist areas, such as creek and river basins. As they begin to grow, the outer tip that is part of the plant shoot is coiled into a round form that becomes a leafy green part of the fern if allowed to mature fully. The frond is picked when the plant is young before its coil has been "unrolled" providing a small, tender vegetable that can be steamed, blanched, stir-fried, or sautéed. When selecting, choose fiddleheads that have a nice jade-green coloring, fairly tightly coiled, a little larger than an inch in diameter, with a short tail of 1 to 2 inches in length. 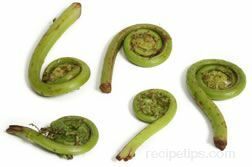 Fiddleheads harvested with long stemmed tails may be fibrous and chewy, so remove any excess length. To prepare, wash the sprouts thoroughly to clean the fiddlehead and to remove the fuzzy brown scales or papery skin that may be present. When prepared, the fiddleheads can be served similar to asparagus or artichoke hearts. If served as a side dish, melted butter, fresh lemons, melted cheese, Hollandaise sauce, or similar ingredients can accompany the sprouts. Fiddleheads can also be used as an ingredient in a variety of foods such as soups, muffins, quiché, or mixed vegetable dishes. Fiddleheads may also be referred to as fiddlehead greens or ostrich ferns. Fresh fiddleheads should be kept refrigerated, wrapped in plastic for the best means of preserving the elastic and fresh qualities of the fern. They can be kept only a few days in the refrigerator before they begin to loose their flavor. To keep for longer periods of time, place the fiddleheads into boiling water, cook for a minute, and then drain off the hot water. Immerse the boiled fiddleheads in an ice water bath, drain the water away, package the sprouts in airtight plastic, and freeze immediately. Freezing will reduce the fresh flavorful qualities of this fern, but it is one way to keep the fern available for special occasions or meals.